The Grand Hotel Vesuvio had a moral obligation to name its roof-garden restaurant after Enrico Caruso, since the tenor was a treasured guest of the hotel . He called it his “Neapolitan home” and after returning to Naples, he spent the last years of his life here. Over a low gas, gently fry two cloves of garlic and remove them when golden. Break two large ripe San Marzano tomatoes by hand and slice up one or two yellow or red peppers; raise the heat and season with salt, a pinch of oregano and plenty of basil. Add a red chilli-pepper. On one side, cut two cougettes into slices, flour them and fry. Cook pasta “al dente” and cover with sauce, sprinkle with fried cougettes. 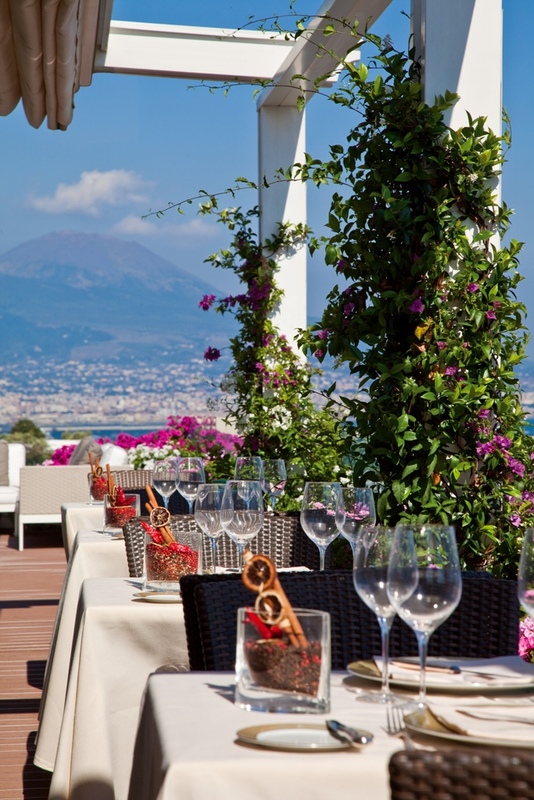 Caruso Roof Garden Restaurant situated on the ninth floor offers a splendid panorama over the Gulf of Naples. Dedicated to Enrico Caurso who made the Vesuvio his Neapolitan home, the restaurant is a homage to the musical legend but moreover to his great culinary passion. Jacket is suggested for dinner. For reservations tel +39 081 7640044. Reservations can be made with a maximum advance of 2 weeks.